Ever since the institution of this "vegetable and chicken" diet a few weeks ago, I've discovered a new appreciation for cooking. I love being able to take different types of vegetables and turn them into dishes that I actually enjoy eating. 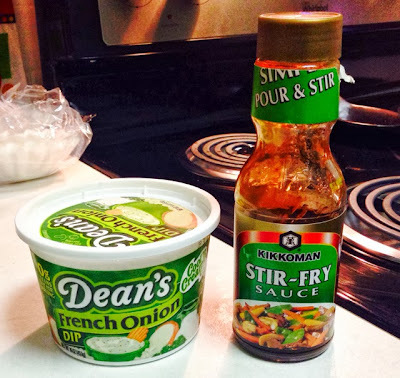 My favorite is French Onion Stir-Fry. There was actually a month-long span in college where a few of us would try our hand at cooking healthier alternatives to our usual pizza/fast food/junk food routine. One night, after we had steamed up some vegetables, my friend had an idea. "Let's just mix in a dab of french onion dip and see how it turns out." I've been making this dish ever since, and it's been a hit every time I make it. Now, if you don't like french onion dip, keep in mind you probably won't like this. Heat up the frying pan to medium, add a package of mushrooms and some pre-cooked chicken strips (you can find packages of these chicken strips near the cold-cuts at the grocery store), and add in a little olive oil. While the mushrooms and chicken begin cooking, chop up some onions, peppers, zucchini, squash, and broccoli. Sprouts are a good addition as well. After about five minutes, add in the chopped up vegetables and be sure to stir well. 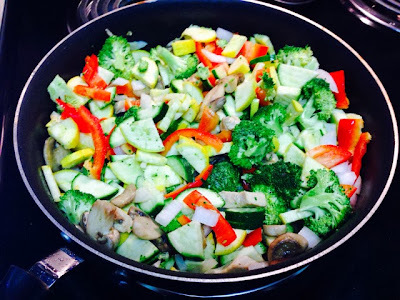 Place a lid on the frying pan to allow the vegetables to steam. Continue to stir every few minutes until everything is properly cooked. 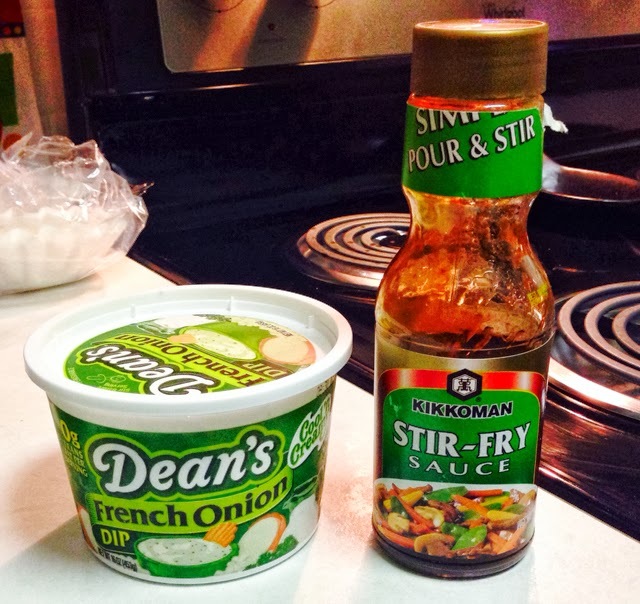 Add a dab of stir-fry sauce, mix it in, and give the vegetables another minute or so to cook without the lid. Then empty the vegetable mixture into a large container, add a dab or two of french onion dip, and stir well. This meal is great when it is first cooked, and the leftovers are still great when heated up. I usually make this meal at dinnertime, and then will eat the leftovers for lunch and dinner the next day. It's incredibly easy, very healthy, and unbelievably inexpensive!